A new series of full-coverage resources developed for the AQA 2016 A/AS Level Geography specification. 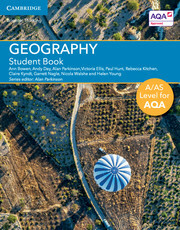 This full-colour Student Book covers all core and optional units for the AQA AS and A Level Geography specification for first teaching from September 2016. Students are encouraged to develop links between physical and human topics, understand systems, processes, and acquire geographical skills. Helping to bridge the gap from GCSE to A Level, it also provides support for fieldwork skills and for the geographical investigation at A Level. A ‘Maths for geographers’ feature helps students develop and apply their mathematical and statistical skills, and a range of assessment-style questions support students in developing their exam skills. 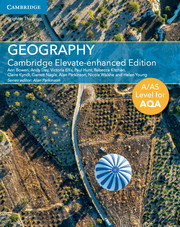 Covers all units of the new AQA A/AS Level Geography specification and assessment objectives, and has been written specifically for the new linear qualification. Includes a range of assessment-style questions to support students in developing their exam skills. Endorsed by the Geographical Association and provides dedicated support at the appropriate level for fieldwork skills, and for the geographical investigation at A Level. Includes support for bridging the gap from GCSE to A Level, and from Key Stage 3 for students without GCSE Geography. Supports students in developing critical evaluation and independent learning skills, important for A Level and essential for progression to Higher Education. Contemporary case studies include questions to test students’ understanding of the issues and relevant application of knowledge. Includes a ‘Maths for geographers’ feature to support students in developing and applying their mathematical and statistical skills. A ‘Thinking like a geographer’ feature includes questions inviting students to critically evaluate and assess links between topics. ‘Investigate’ features give ideas for research and investigation to support students in developing independent learning skills.